Spoonful’s delicious CHOCO+ are made in the USA. All of our ingredients are sourced from the USA. 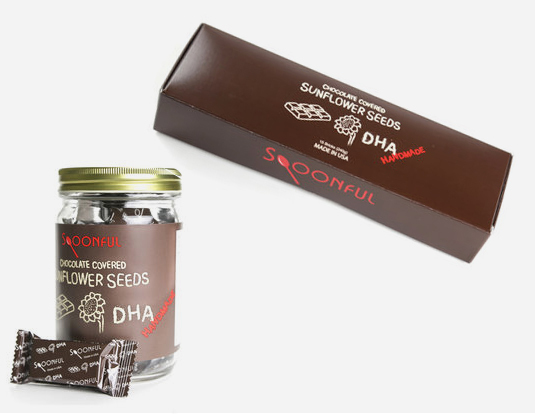 We melt our mildly sweet, quality chocolate and blend our roasted sunflower seeds together by hand, to create a tasteful balance, CHOCO+ is a tasty snack that contains premium DHA sourced from algae, which also contains several health benefits. We added DHA to our chocolate in order to give more, instead of making an ordinary snack. Although delicious by itself, CHOCO+ is also perfect to top off any dessert you wish. 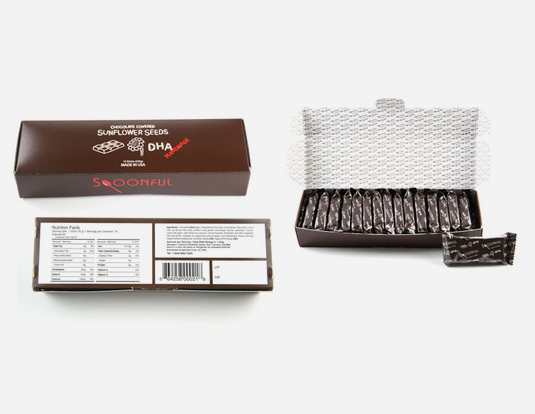 CHOCO+ is packaged into a vacuum-sealed, zip-lock bag in order to maintain integrity and taste. Our Roasted Sunflower Seeds have a flavorful, toasted taste! We roast our sunflower seeds to emphasize its’ simply good, nutty flavor. Though it makes for a wonderful snack. These sunflower seeds also make a terrific addition to your favorite dessert. They can also give your dessert something extra by having a satisfying, crunchy texture. These Sunflower seeds are an important source of protein, minerals and vitamins that are part of our daily nutrition.